You must be a member of the Madrid Art Lovers Group to attend this activity. Would you like to join this group? UPDATE: Juan Gimeno, a specialist in Origami will be our guide tomorrow. Therefore, a small participation will be required (2 or 3 euros/person) to cover expenses for his service. The visit will be guided in Spanish. See you tomorrow! We are glad to invite you to visit this nice exhibition of the art of Origiami, as it is in its last days. Protected content presents a new temporary exhibition of own production, in collaboration with EMOZ, School Museum of the Origami of Zaragoza. 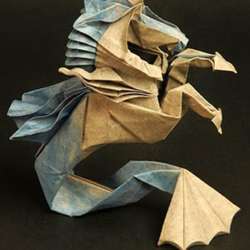 The Japanese art of origami has transcended the frontiers and the traditional techniques and has been placed at the limit of contemporary art, producing surprising pieces of singular beauty, both abstract as figurative. The exhibition is one of the activities on the occasion of the Anniversary of the diplomatic relations Japan-Spain, which is celebrated this last year, Protected content . Join us in order this magnificent exhibition in the great Protected content After the activity, we will have something to drink close by the museum. Glad to meet you on Sunday! !